It’s almost August in Arkansas. That means it’s hot and the air is so heavy and stands so still I can lift a chunk of it in one hand and cut it with a knife. How can someone who hates hot weather keep cool? She gets creative. In addition to tall glasses of sweet iced tea, sun dresses, and air conditioning cranked so low you could hang meat from my ceiling, I decided to pull out an old favorite: a book about dog sledding that I read a few years ago. There’s nothing like the thought of the Iditarod to put ice in one’s blood, now is there? This isn’t a book review, although if you want to read more about the serum run the book I read is an excellent choice. Pull up your chairs and settle in. Let me tell you a story about what really, truly happened one long wintry night in Alaska – where winter nights last for months. Prior to reading The Cruelest Miles, a fabulous book by Gay Salisbury and Laney Salisbury about the legendary inspiration for the annual Iditarod dog sled race, my own knowledge about the Serum Run came from the news reports of the Iditarod, most of which I ignored, and my son’s old videotape of the animated feature, Balto, which I watched and listened to ad nauseum when he was a little guy. Although I suspected that the children’s movie had taken liberties with the facts, I was compelled to buy the book because of it as much as by the chance to read another vignette from American history. And yes, the movie did take generous liberties with the facts. Apparently, so did the creators of the statue of Balto that sits at the Children’s Zoo in Central Park in New York City. The 674 mile trek was endured by brave Alaskan dog-sledders to stop the Nome diphtheria outbreak in the dead of winter, 1925. The Salisburys’ book is altogether readable and informative not only about the desperate race against the disease, but also about dog-sledding, Alaskan topography and climate, the personalities and temperaments of the sled dogs themselves, and of the score of determined men who accepted the challenge to risk their own lives to save a town of dying children at the top of the world almost 100 years ago. Suspense gripped the entire world during each leg of the desperate race to get the diphtheria anti-toxin to Nome in time to save the town. The book intersperses fascinating facts and asides which leave the reader hungry for more, but not impatient with the interruptions of the dramatic unfolding of events. The story has great flavor because of the fullness of its telling. As each team of dauntless dogs is hitched to their sled, the anti-toxin’s epic journey is punctuated with the unfolding crisis back in Nome. When an Eskimo family brought one of their four children to him in the fall of 1925, Nome’s local doctor, Curtis Welch, did not immediately suspect diphtheria, nor did he realize that he was seeing an epidemic in its infancy. He believed at first that he was dealing with tonsillitis, inflammation of the tonsils and throat caused by a virus or bacteria. None of the other children in the family were ill, and the parents reported no other instances of sore throats back in their village. Since diphtheria is highly contagious, it was unlikely that only one child would be affected, and in the decades he had been practicing medicine in Alaska’s northwest, no cases of diphtheria had been diagnosed. The Eskimo child died the next morning, though. Although Welch first concluded the cause of death to be from tonsillitis, which was rare. After the cases of diphtheria began making themselves known, though, Welch changed the death certificate to reflect diphtheria as the child’s cause of death. That fall and winter Welch noticed an unusually high frequency of tonsillitis and sore throats. On Christmas Eve, he saw a seven-year-old girl with a severely sore throat. Her Eskimo mother would not permit him to examine her fully without the child’s Norwegian father present, and the father had left the area on business. The little girl died four days later. This was now the second death from tonsillitis. Deaths from tonsillitis did occur, but even in days before antibiotics they were extremely rare. When news came that four other native children had died after suffering from sore throats, Welch began to suspect that something was amiss. On January 20, a three year old boy, Billy Barnett, displayed the characteristic gray membrane of diphtheria. Dr. Welch was no longer just guessing. Since the diphtheria antitoxin his hospital had on hand had expired, and the fresh antitoxin he had ordered during the summer of 1924 did not arrive before the Bering Sea froze completely that fall, Dr. Welch had no choice but to watch the tiny boy die. Then the day after Billy Barnett’s death, an Eskimo girl with obvious diphtheria died. Dr. Welch was aware of the significance of the problem. During the influenza pandemic of 1918, the native population had attempted to flee the disease and instead spread it further. If a panic occurred, the disease would not be limited just to Nome’s population of about 1500. Diphtheria is highly contagious and the bacteria was capable of living for weeks outside a human host. Panicked flight would guarantee the spread of the epidemic faster and farther, and containing it, especially during northwest Alaska’s brutal winter, would be impossible. The town council met and were informed of the dire circumstances. Nome had been devastated by the flu pandemic six years before, losing more than half its population. Of 300 orphans created by the flu pandemic in Alaska, 90 of them were in Nome. The men were well aware of the seriousness of the situation. The decision was made to quarantine the town and to prohibit any group gatherings. Children, the ones most likely to be affected by the disease, would not be permitted to leave their homes at all. Two urgent telegraphs were sent. One went to the US Public Health Service in Washington, DC. The other was an all-points bulletin for the entire of Alaska. Nome’s medical care team was quickly overwhelmed by sick children exhibiting the same symptoms. Not only was a deadly epidemic spreading rapidly through the town and neighboring villages, but Dr. Welch’s medical facility, the best in the region, was cut off from the rest of the world by pack ice and the harsh arctic winter. While this might be good inasmuch as a quarantine was concerned, no one would survive the epidemic to tell about it unless a delivery of antitoxin got to Nome fast. Keep in mind, now: it’s the dead of winter two degrees below the arctic circle. The sea is frozen. There was no rail service within 700 miles of Nome. Even today there are no roads in or out of Nome, and in 1925 truck transport over such a distance, without roads, was completely out of the question.The only available airplane was a World War I model with an open cockpit – this was 1925 – which would have been almost certain suicide for the pilot in the dead of the North Alaskan winter. 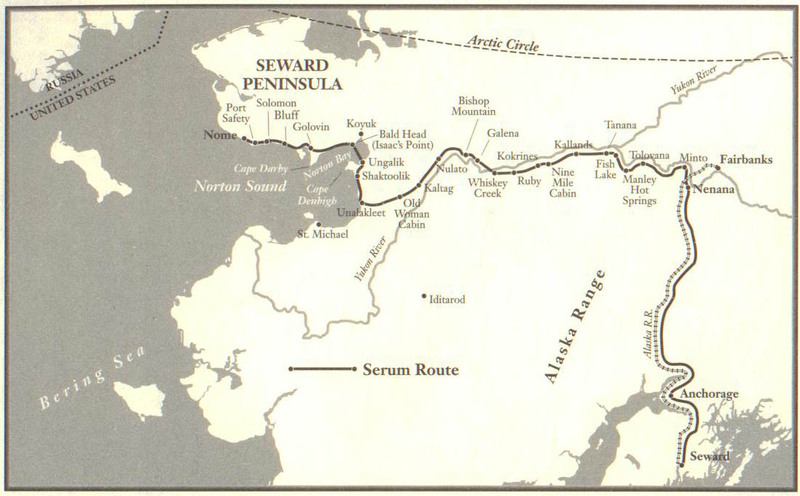 The only way to get the serum to Nome was by dog sled, if serum could even be found. This is quite a hot information. I’ll share it on Digg. Though I think Kent Kantowski’s “Serum Run” web page deals with the modern race referred to as the “Serum Run”. I see nothing on his pages, after a cursory surfing, which has anything whatsoever to do with the actual 1925 Nome Serum Run. Even if he does link to Norm Vaughan’s history page. Just FYI. Impressive work there! I found your research to be admirable, and your references commendable. You’ve done a good job with this, and I appreciate your referencing my website as one of your sources! I hope you’ll stop back and join up on the forums of my site…there’s lots more there that doesn’t appear on my main site! This blog has moved to aramink.com. Please visit me there.